Hi, I am interested in your 1963 Dodge Polara (stock #5038-CHA) listed on Autotrader for $29,995. I'd like to get more information about this vehicle and confirm its availability. Hey Mopar fans, as well as lovers of the unique and powerful, its time to pay attention. 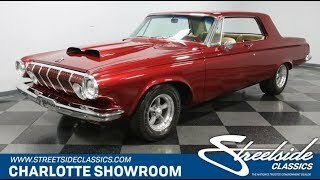 This 1963 Dodge Polara is the seldom-seen muscle car youve been looking for. From the shining presentation to the thumpin 440 V8 under the hood, its everything you want in a cut-above classic American coupe. This was the era when the Mopars looked like nothing else on the road. It combined the rounded styling of the revolutionary turbine cars and the square-jaw toughness that would make their upcoming muscle cars so aggressive. In fact, this one does aggression particularly well with the hood scoop and competition-style American Racing Torq Thrust wheels (and do you see how much wider the rear ones are?) But theres more here than just intimidation. The deep red has a nice luster in the sunlight, and it makes for a great backdrop for the wraparound chrome bumpers, distinctive trim, and crisp body lines. The result is a hardtop that has both power and style. The interior was crafted with care as the exterior red returns, and now its combined with a custom two-tone tan. Not only does it look sophisticated, but also thanks to the seats finished in leather, your passengers will feel the supple distinction. People will also love pointing out the little touches like the push-button transmission and the AM radio thats still on display. But this car is out to impress the driver the most. Thats why you have the individual comfort of bucket seats, a leather-wrapped sports steering wheel, and a full set of auxiliary gauges cleanly mounted under the dash. The engine bay is also part of this carefully crafted image of speed and sophistication. Thats why they took the time for the overall tidy presentation that includes details like the polished components and a color-matched air topper. But more than just looks, youre also going to love the performance. This Polara has been upgraded to the legendary 440 cubic-inch big block. Plus, it inhales deeply with four-barrel carburetor, and exhales with authority as Hedman ceramic-coated headers that feed a rumbling dual exhaust. And they even made sure its supported by the right components like an MSD ignition and aluminum radiator. The A727 Torqueflite three-speed automatic transmission knows how to handle this big power, and its also great for just cruising. So are other great driving features like power steering and power brakes w/discs up front. This is a powerful coupe thats been built right so that the appeal goes well-beyond its V8 muscle. Its a great total package thats ready for the first person who grabs this deal. Call now!